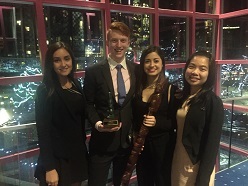 Students from QUT Business School have won an esteemed international competition, beating some of the finest business schools in the world to secure the prestigious prize.The team won the Sauder Summit, held at the University of British Columbia, in Canada, a six-day competition that pits students against each other to solve a series of real world business challenges. The team, consisting of Sheridan Eccleston (Finance and Entertainment Industries, 4th year), Ying Ling Chin (Accounting, final year), Celeste Burke (Marketing and Law, 2nd year) and Ryan Nolan (Finance and Law, 3rd year), beat Tsinghua University, Copenhagen Business School and the University of North Carolina in the final. The three challenges the team solved were all based on real problems a nominated company faced. For example, teams devised a strategy for Molson Coors, the second largest brewer in North America, for the rise of the craft beer industry. The team’s final case looked at growing the business services (consulting) division of international telecommunications conglomerate GLENTEL. The winning plan suggested becoming the leader in rural services integration, that included communications for the healthcare industry in under serviced areas, as well as expansion into developing countries where the other (larger) players had not yet penetrated. “The 12 teams in the competition represented some of the best business schools in the world, so for the QUT team to not only compete, but win the entire summit, is an incredible achievement,” QUT Business School Assistant Dean (International) Andrew Paltridge said.